Fifty years ago this week Lyndon B. Johnson cast a dream for a “Great Society” that was largely ignored or even sneered at. It was delivered only a few months after President Kennedy was assassinated, which elevated him to the White House. In fact, no President had a greater impact on the nation in the 20th Century – not even Franklin Roosevelt. His New Deal programs created jobs for the unemployed and Social Security lifting millions of the elderly out of poverty. However, LBJ’s passage of Medicare for the elderly and Medicaid for the poor was as important for the safety net as Social Security. His Civil Rights Act of 1964 and Voting Rights Act of 1965 gave blacks an unprecedented ladder of opportunity which they seized. The Washington Post reports there were only about 300 African American elected officials before 1965 – but 1,469 by 1970 and more than 10,500 in 2011 – including the President. 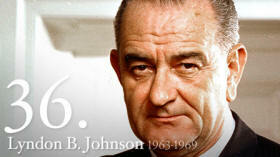 LBJ was elected in 1964 in the biggest landslide ever along with huge majorities of Democrats in the Senate and House. They passed 280 major bills in two years – the most productive ever. Major cultural institutions were born - The National Endowment for the Arts, the National Endowment for the Humanities and the Corporation for Public Broadcasting. LBJ said the Great Society “serves not only the needs of the body and the demands of commerce, but the desire for beauty and the hunger for community.” That’s how we got “Sesame Street,” PBS’ NewsHour and support for a legion of symphonies and theaters. The Elementary and Secondary Education Act provided the first federal funding of public education ever. It was targeted at improving the schools of low income students. Head Start was launched to give poor kids preschool for a “head start.” I covered the issue for TIME and regret to say that there was little evidence that these programs made much difference. More successful were the first federal grants and loans to college students. The “War on Poverty” was another ambitious initiative. Results are debated to this day. The Office of Economic Opportunity funded neighborhood activists who often fought City Hall, but gave many minorities their first political experience. It was abolished in 1981. The Food Stamp program remains a major support of low income people. The poverty rate is an income of $23,850 for a family of four. Officially, the number in poverty fell from 19% to 15%. However, that only counts cash income, not Food Stamps, housing subsidies and the Earned Income Tax Credit. Malnutrition has disappeared, infant mortality has dropped, and 80% of poor complete high school and 40% attend or graduate from college. Medicare alone reduced poverty of the elderly from 35% to 9%. I was able to interview Johnson in the White House for an hour for a TIME cover story on John Gardner, who was his Secretary of Health, Education and Welfare (HEW) assigned the task to implement the Great Society. It was the most extraordinary interview of my life.